Obituary for Patricia "Patty" Lynn Wilson | Grissom-Martin Funeral Home, Inc.
Patricia “Patty” Wilson gained her wings on January 29. For 57 years she has brought joy into the lives of family, friends and acquaintances by her enthusiastic, no-holds-barred embrace of life. Singing, dancing and greeting her loved ones along the streets of gold mark the celebration of her new life. Born in Somerset, KY to Sammy and Jeannie Keltner Wilson, she was adopted by Edie Egbert following their deaths. Two sisters surrounded her with love, acceptance and full participation throughout her life – Janie (Harold) Edwards and Karen (Jackie) Jewell. Her nieces and nephews brought much delight to her – Jeananne (Greg) Zink, Nathan & Natalie Zink, Josh (Marissa) Jewell and Jaclyn Jewell. Step-father Bobby Willis preceded her into eternity. A faithful member of Columbia United Methodist Church, it was her personal mission to greet everyone in the sanctuary each Sunday. Her smile was a ray of sunshine and her persistence ensured you would shake her hand even if you were distracted. She was proud to be a Red Hatter even though her hat was pink for several years. Join the family in celebrating her birthday into Heaven and eternal life Sunday February 3 at Columbia United Methodist Church at 2:00 PM with Dr. John Hatton officiating. Bring your favorite Patty story to share. Visitation will be held at Grissom- Martin Funeral Home Saturday February 2 from 5 – 8 PM, Sunday from 7 AM – 12:30 PM and 12:30 PM until time of service at the church. Pall bearers will be Lisa Bailey, Roger Brooks, Missy Carter, Danielle Kearney, Mark Newton, Justin Robinette, Jackie York, Bennie Burr, Harold Edwards, Jackie Jewell, Josh Jewell, Devyn Sams, Keith Young, Greg Zink and Nathan Zink. The family is appreciative of all the folks in Columbia and Adair County who have welcomed Patty as a part of the community, encouraged her and allowed her to live her life fully. You have all been Patty’s angels. 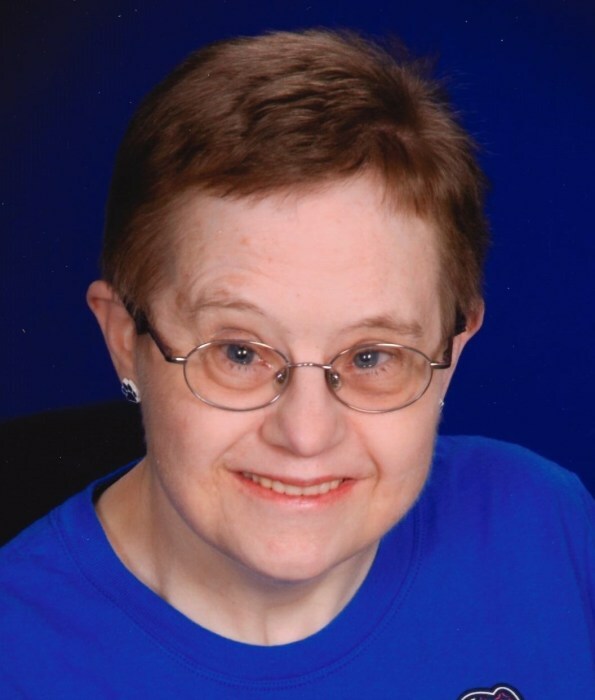 In lieu of flowers, her life can be celebrated by a donation to Down Syndrome Aging and Research Study, 800 S. Limestone Street, Sanders Brown Building, Lexington, KY 40536-0230 or Green River Animal Shelter, 455 Apppleby Drive, Columbia, KY 42728.